Whether in search of better managers, higher pay or more recognition, people are changing careers faster than ever. The average tenure of wage and salary employees is 4.6 years. 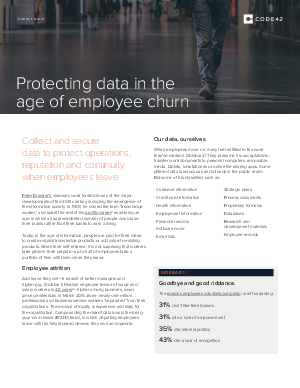 With more and more employees working exclusively with corporate data, higher attrition translates to higher levels of data loss. Many employees feel entitled to the work they’ve created and ignore security policies, simply taking the data they want. While some of this pilfered data is innocuous or already in the public realm, some of it is classified, such as customer and employee information, payment data and intellectual property. Code42 provides enterprise organizations with a way to view, manage and protect data from walking out the door. Download the white paper to learn how.